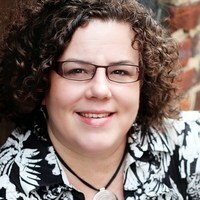 The Book Monsters are super excited to introduce Lana Krumwiede. Lana's debut book, Freakling, releases on October 9th! A thrilling, fast-paced dystopian novel about the dangers of unchecked power and the dilemmas facing a boy torn between two ways of life. Everyone has psi but me. I took a long time to find the road, but once I did, it was pretty smooth. I wrote for children's magazines for many years and really enjoyed that. I learned a lot of things about writing–how to write concisely, how to submit, how to deal with rejection, how to revise–and those skills have served me well. When I finally had an idea that was suitable for a novel, it took me over two years to write it. I would write myself into a brick wall, go back and pull everything apart, get rid of what I didn't like, put it back together, then keep writing. That happened several times. But by doing that, I learned a lot about plot structure. Once I had a decent manuscript, everything happened quickly. I signed with an amazing agent, Molly Jaffa, we revised together, the book sold at the first publisher it was submitted to. More revision work after that with the fabulous Kaylan Adair at Candlewick, and now we're nearing the release date. It's still hard to believe it's really happening! How did the idea for "Freakling" come to you? I was attending a writers group and one of the comments was about writing in a way that makes it easy for the reader to visualize. Another writer in the group said that she does not visualize books while she reads. This was a stunning revelation to me. I thought everyone visualized, like seeing a movie while you're reading. It turns out not everyone does. I thought about this for a long time. Is this a learning disability? What other things would be hard to do if you couldn't visualize? What kind of society would be hard to live in if you couldn't visualize? I came up with this idea for a place where everyone had telekinetic powers, where it was just a way of life, and without it, you wouldn't be able to function. I was intrigued by this idea of everyone else having the super powers, but not this one kid. I think a lot of people feel that way. 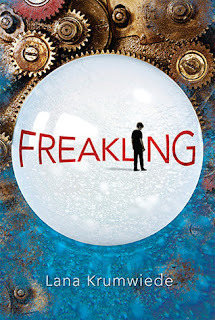 What was the research process for "Freakling" like for you? I read a lot about telekinesis (the more accurate term is psychokinesis), a lot of theories about how it might work. Some were more scientific in their approach and others more mystical, but I gleaned ideas from all of that. I needed to come up with some limitations, some principles for how this works on a society level. What are the rules? What keeps people in check? How could things go wrong? I had a lot of world building to do! For me, there are three main parts of the process. First, developing an idea into a story. Love that part. So fun! Anything is possible! Second, writing the first draft. Hate that part. It's like wringing my brain to make the sentences come out. Ouch! My first drafts are bad. Really bad. I hate writing badly, but I know it's part of the process, so I have to make myself do it. Third, revising the first draft into something amazing. LOVE THAT PART! I love seeing my story get better and better. Finally I get to see the amazing story that I hoped would emerge. That is absolutely my favorite part. I never expected the whole writing experience to teach me so much about my own life. I find the whole creation process so inspirational. It is a metaphor for creating your own life story, for making decisions, for holding up under adversity and obstacles, for building your own character. When were you born and how do you get your ideas?